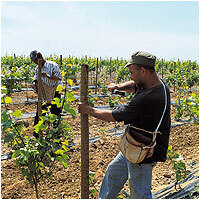 Robert Skalli wines were born in the bountiful, sun-kissed Languedoc, the largest wine-growing region in France. This region of southern France is fortunate in having a climatic environment where some parcels ripen early, while others take longer. The soil is predominantly composed of limestone, clay, gravel and loam, with patches of marl. The blends created from these diversely rich terroirs bring elegance and finesse to our wines. West Languedoc : a temperate climatic zone and very stony, chalky-clay soils producing very dense, aromatic wines. Central Languedoc : a hotter climatic zone, with earlier ripening, where two types of soil were chosen: a gravelly clay soil giving well-structured wines with noticeable tannins; a soil of limestone fragments giving softer wines with coated tannins. North-east : a cooler, later-ripening climate, with limestone soils providing fruitier wines. This original method produces wines of the highest quality that express the generous character of the Languedoc region. Our quality approach also integrates the vinification process, conducted under the watchful eye of a Skalli oenologist. The grapes are picked when they are perfectly ripe. After destemming, they undergo a long maceration period. All our Robert Skalli wines are partly aged in French oak barrels and partly in vats to give the final blend all its complexity while conserving its primary fruit.